Abusers need help! The abuse cycle is a common response to stress and can lead to abusive behaviour. When the abuser can recognize that they are in a cycle and deal with their feelings at that stage, abusive behaviours can be prevented. It's never to late to stop and think before we choose to act. This laminated poster comes with a set of notes titled - A Guidebook for: psychologists/counsellors, educators, families/individuals. The notes have information about the topic and a number of useful activities that can be used in conjunction with the poster. 12cm round magnetized sheet ideal for the fridge and filing cabinets. Full color, comes with mood arrow to select what's behind your anger. So, feeling angry today? Are you jealous, disappointed, worried, frustrated, sad, lonely....? Anger � Managing Your Anger � what's behind it? Anger must surely be the most complex and confusing of all human emotions. It causes confusion when it is viewed as a behaviour and connected with violence, withholding, demanding, aggression and cruelty, rather than being addressed as a feeling. And it is 'just' a feeling - that is often expressed very inappropriately. 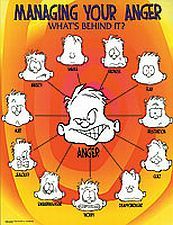 The Anger poster shows what feelings often sit behind anger, and suggests possible ways to manage anger. 12cm round magnetized sheet ideal for the filing cabinet or fridge. Full color. Includes mood selector to choose the causes of your anxiety. Anxiety is one of most common issues in mental health in Australia today. 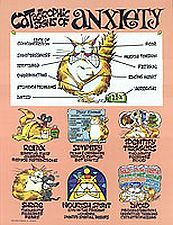 The Anxiety CAT poster identifies eleven of the main behaviours associated with feeling anxious and suggests ways to cope with them. Stick this to your white board or fridge so that others know how you are feeling. 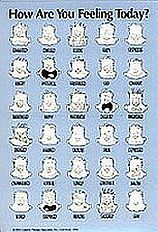 Blue, magnetized sheet with all 30 "feelings" faces. Character - How Is Your Character Today? Are You? Character is the structure on which your thinking and behavior are baed. Character is the way you can "characteristically" be counted on to act. It is the way you have put together your ethics, morals, values, and beliefs. Depressed ...what needs am I neglecting? Depression affects many Australians every year. The Depression Poster reminds us that looking after our emotional and physical needs can help us to avoid depression. This laminated poster comes with a set of notes titled - A Guidebook for psychologists/counsellors, educators, families/individuals. The notes have information about the topic and a number of useful activities that can be used in conjunction with the poster. Magnetized sheet in full color with all 15 factors that contribute to depression. Includes mood selector to choose your state of being. 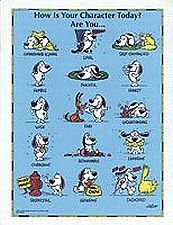 Here are 30 feelings on a magnetized sheet that you can use on your fridge or whiteboard or filing cabinet to let people know how you are feeling today. Feelings � How are you feeling today? 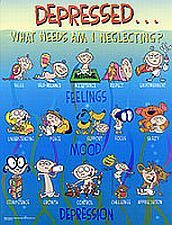 The Feelings Poster is a tool that can help us share and express feelings. 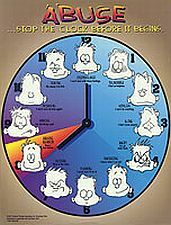 It's many faces express and identify a range of feelings that can increase our awareness of emotions, improving our emotional intelligence. Mood Dude Stress Relievers, commonly known as The Mood Dudes, are five squeezable faces that help relieve stress and encourage conversations about feelings. Sized 70mm x 70mm there are five in the set - Anxious, Happy, Disgusted, Shocked and Sad - but you might identify them otherwise - facial expressions can be like that! These Mood Dudes have the same faces but different races so they are great for our multicultural population. The five squeezable faces help relieve stress and encourage conversations about feelings. So do the different races experience their feelings differently? Sized 70mm x 70mm there are five in the set - Anxious, Happy, Disgusted, Shocked and Sad - so how do these feelings look on different coloured faces? Self-esteem is the cornerstone of how we think and feel about ourselves. It allows us to to lead a meaningful and positive life. Magnetized sheet to remind you of what factors are most influencing the way you feel about yourself. 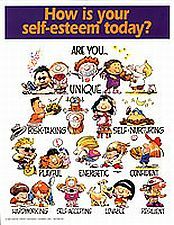 How is your self-esteem today, and why?